Heat an outdoor grill or a grill pan. Cut each chicken thigh into 2 pieces. Peel the pineapple and cut it into 1 1/2-inch chunks. 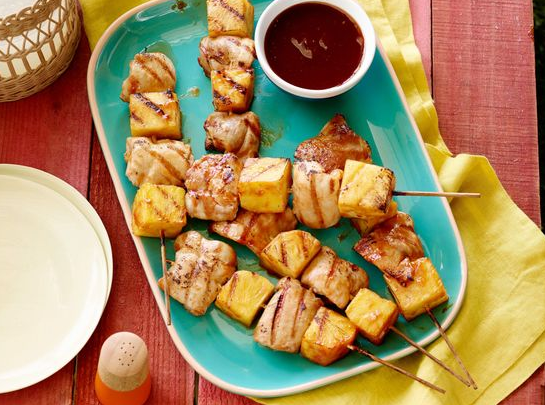 Alternating between the chicken and pineapple, thread the pieces onto the skewers. Brush them with olive oil and season them with salt and pepper. Remove the garlic cloves from the barbecue sauce and discard; put about half the sauce into a small bowl for later. Brush skewers with some of the sauce. 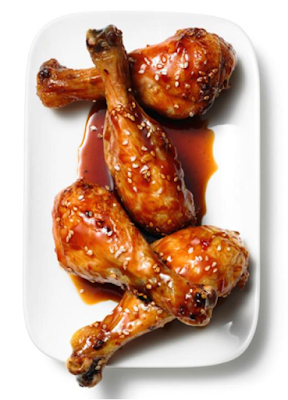 Cook them on the grill, basting regularly with the barbecue sauce, until cooked through, about 10 to 15 minutes. Serve with reserved barbecue sauce on the side for dipping.